I love to watch bees as they gather pollen—they seem so industrious and focused as they systematically work their way through a group of flowers. 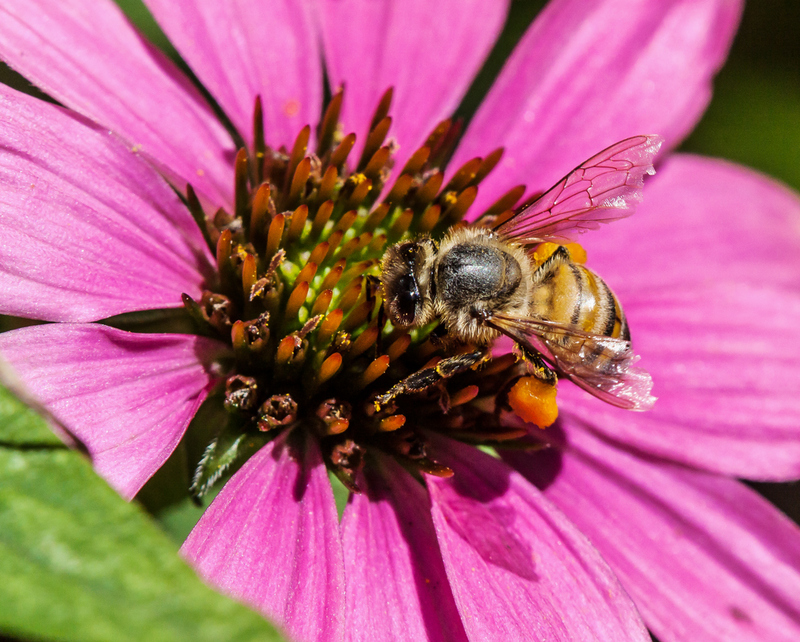 This honey bee had both of its pollen sacs almost completely filled when I spotted it yesterday on a cone flower in the garden of one of my neighbors, fellow photographer Cindy Dyer. One of the joys of shooting with a macro lens is that it lets you capture so many fine details, like the pollen grains on the legs of this bee and the slight damage on the trailing edges of the bee’s wings. Bees are also a great subject to practice macro techniques, because they often let you get really close without being spooked and flying away. Nice Mike! Love the detail! What an amazing photo of this industrious honeybee! The tattered wings and overflowing pollen sacs will capture Benjamin’s interest. “The hum of the bees is the voice of the garden.” – Elizabeth Lawrence. Thank-you, Mr. Mike!